OAK GROVE, Mo. — The 41 Action News Hy-Vee Big Game Matchup once again finished in dramatic fashion. 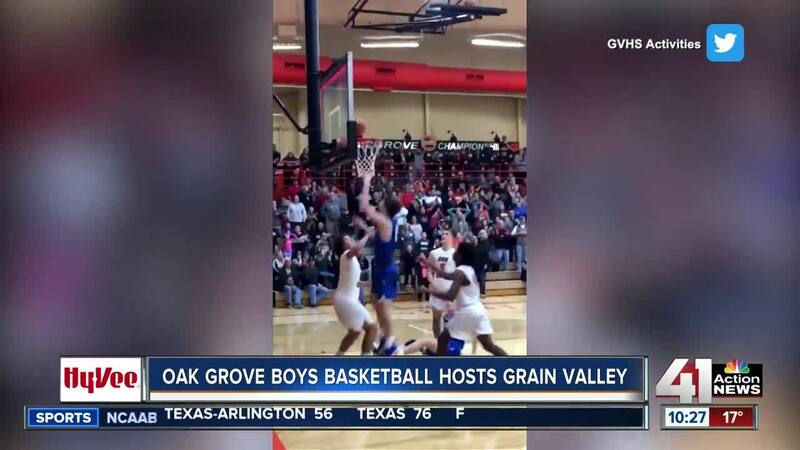 Grain Valley completed a 21-point comeback win when Josh Kilpatrick scored a tip-in at the buzzer to give the Eagles the 65-63 win Friday at Oak Grove. The host Panthers started the game strong behind the Trey Bryant's dominant play in the paint, but Kilpatrick and company roared back in the second half. A few weeks ago, the Hy-Vee Big Game Matchup featured a wild finish between Oak Park and Winnetonka. Jackson Satter hit a game-winning three-pointer at the buzzer for the Northmen, which was featured on ESPN SportsCenter's Top 10 plays the following day. The Oak Grove girls won 39-27 during the doubleheader, which was among the games our sports team covered Friday night.